Guess where I drove today? Nowhere! Today was my day off and my second night in Durango. Today I was going to let someone else do all the work and transport me instead. 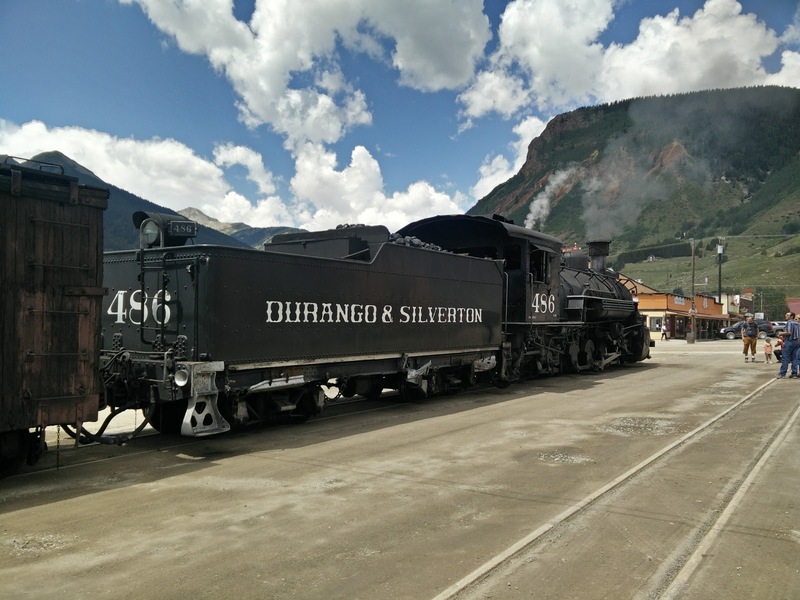 So I caught the narrow gauge railway the 42 miles to Silverton, up in the mountains. I'd actually driven past Silverton the day before, but this journey was going to take four times as long, and that's what made it special. 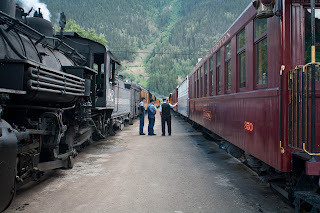 The line has been running continuously since 1882, and its impressive black 2-8-2 engines were built in 1920. There's a mixture of rolling stock - I took the budget option, the open gondela, because I wanted the view more than anything else. I had to get to the station by 8.15, and there already quite a crowd. I hadn't realised what a popular tourist attraction this was. The staff added to the atmosphere by dressing in period costumes. The journey starts, with much hooting of the steam whistle. It takes us straight through town and across the crossroads where it surprised me the day before. The train follows the course of the Animas river (unlike the road which takes a different route). But the river doesn't like to make it easy. 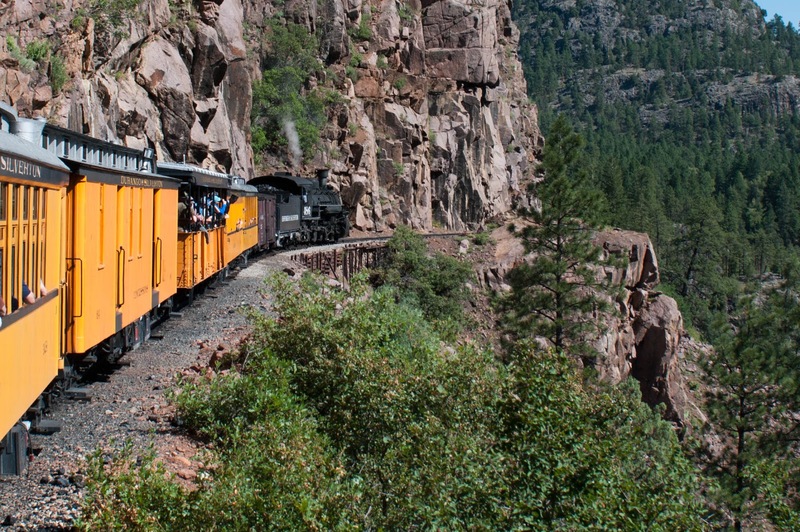 When it reaches the Animas canyon, there's no longer any room for the railroad alongside the river. The train now takes the 'highline', the most dramatic part of the journey. We're on a ledge cut high into the canyon wall, only slightly wider than the train. The teenagers in my carriage proved this by being able to touch the canyon face as it passed outside the carriage. On the other side is a long, sheer drop to the river as it races through the canyon. 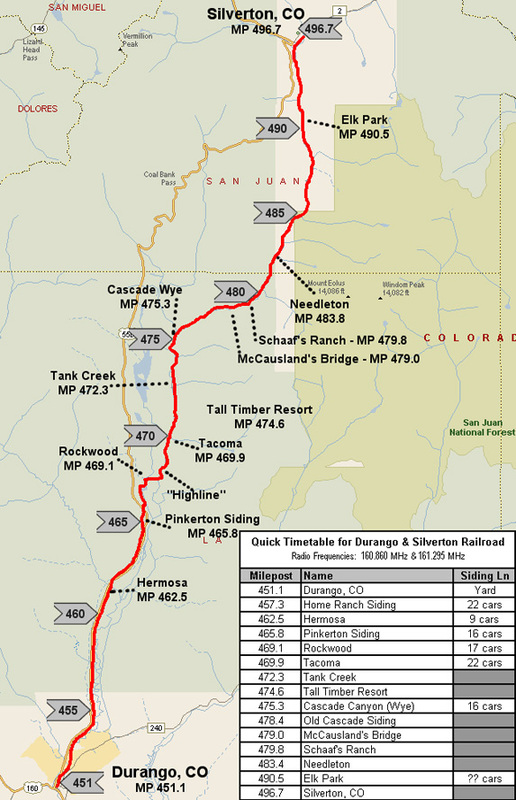 Once out of that section, it resumes its route alongside the river, eventually arriving in Silverton, where we get a 2 and a bit hour break. 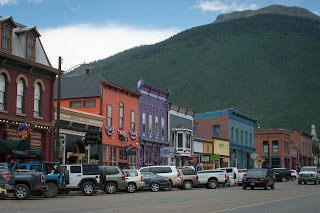 Silverton had a real wild-west feel to it - timber buildings, all but the main street were unpaved, nestled into a valley between high mountains. There were saloons, restaurants and countless gift shops determined to make as much in two hours. I regretted not trying to fit in an overnight stop here, as I wondered how the place would feel once the trains had gone. It was wonderfully remote. I expected the journey back to be less interesting - I'd brought a pile of books - but actually it was just exciting on the way back. This time I shared a carriage with an excited Latin family that cheered and gasped every time the train turned a corner and gave them a new view. They cheered every time the train blew its whistle. Even pouring rain (in an open sided carriage!) didn't dampen our spirits. Apparently the train just freewheels almost the whole way back to Durango - I'm glad I didn't find that out until I arrived back. Back in Durango I had a really good beer and a really indifferent dinner (can't complain, I've done very well so far). Now it's time to go to New Mexico. So obviously I'm missing something. 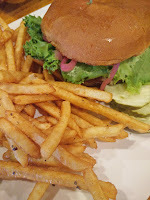 This is the highest rated restaurant in Durango according to more than one review site ... but why? Maybe it's because it does something for all the family. 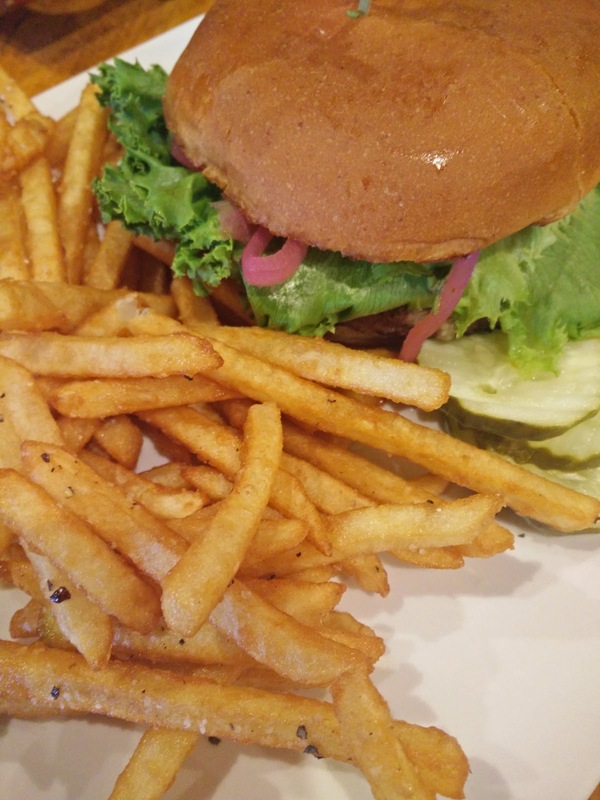 Kids can have pizza and burgers, parents can have steak. But ... it was noisy, it had sports TV, it had annoying kids running around, it was messy and the food was utterly unmemorable. The two stars are for the beer. UK readers - it reminded me of a Harvester. So fine if that's what you're after, but no way is this the best restaurant in Durango. But maybe the long line outside disagrees.